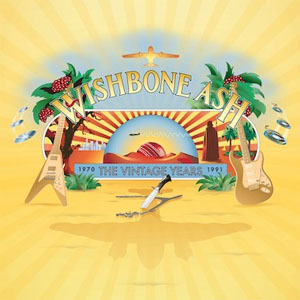 Share the post "News: WISHBONE ASH – Limited Edition ‘Vintage Years’ 30-CD Box Set out 20 April 2018"
Wishbone Ash – one of the UK’s most enduring and best-loved rock acts – are celebrated on 20 April with the release of a comprehensive deluxe 30 CD box set, The Vintage Years via Madfish. This collection – authorised by all of the original band members – is loaded with rarities, memorabilia, a new interview and a lavish 156-page hardback book. A third of this new collection features previously unheard and unreleased material. This box set is strictly limited to 2,500 copies and includes all 16 studio albums between 1970-1991, all of which feature bonus material including rare album outtakes, B-sides and 12 previously unreleased studio tracks. These are presented in mini-gatefold sleeves. Three of the 16 albums are currently out of print on CD (Nouveau Calls, Here To Hear & Strange Affair). The box set will feature brand new cover artwork designed by Colin Elgie, the original designer behind the award-winning Live Dates sleeve artwork. All music has been remastered from the original multitrack and ¼” tapes, sourced from Martin Turner and Andy Powell’s personal collections, and from the Universal Music and Atlantic archives. Accompanying this thorough collection of repertoire is a 156-page coffee table hardback book written by Classic Rock’s Dave Ling, which includes personal photos, rare posters and flyers and collector’s memorabilia ( A 7″ flexi disc for the single Blind Eye, the first of the 11 Japanese singles series andndividually signed photos of each band member: Martin Turner, Andy Powell, Ted Turner, Steve Upton and Laurie Wisefield. Martin Turner is playing UK dates from whilst Wishbone Ash (Andy Powell) are currently touring in North America. 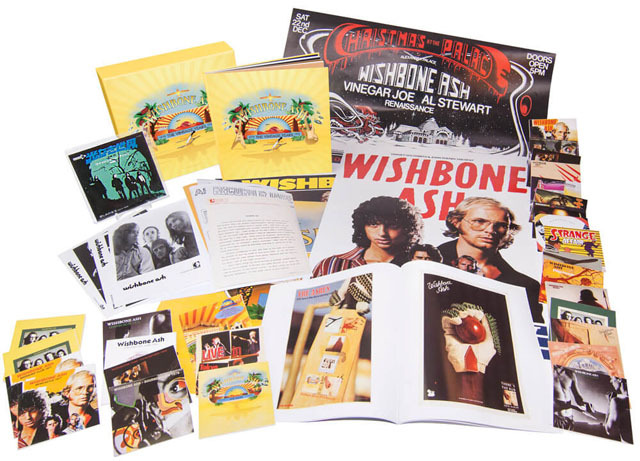 This entry was posted in Album News, All Posts, NEWS and tagged Andy Powell, April 2018, book, box set, Limited Edition, live albums, Madfish, Martin Turner, memorabilia, posters, The Vintage Years 1970-1991, Wishbone Ash. Bookmark the permalink.